Situated at the mouth of the River Thurso, the harbour was established more than a thousand years ago, when Vikings used it as a port and fishing base. The name 'Thurso' comes from 'Thorsa', meaning 'Thor's River' in the Norse language. During the 1200s the Scots evicted the Vikings from the Caithness area, but Thurso continued to develop as an important fishing port. By the 1850s a new harbour was being built at Scrabster, to the west of Thurso, thus reducing the importance of the river harbour. 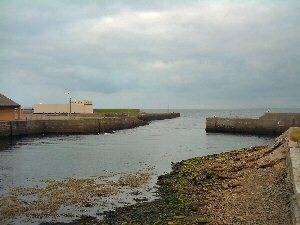 Nowadays Thurso Harbour is used by creel vessels and local pleasure craft and has recently had its light upgraded.